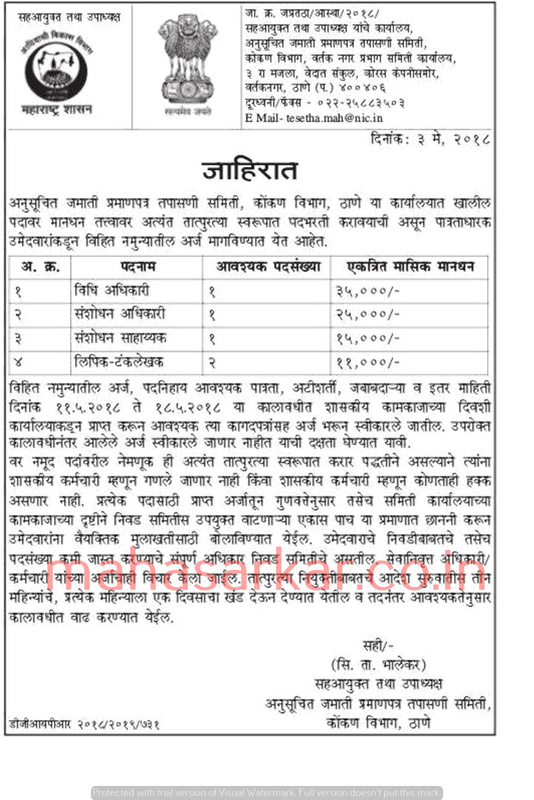 Adiwasi Vikas Bhavan Konkan Vibhag (Scheduled Tribes Certificate Verification Committee), Thane Published Job Notification for 05 Research Officer- Law Officer & More Posts. Candidates who wish to apply must look at Adiwasi Vikas Bhavan Konkan Vibhag Research Officer- Law Officer & More Recruitment 2018. Eligible candidates can apply Offline before 18-05-2018. Interested & Eligible candidates can send their application along with all the necessary documents and testimonials to Office of the Joint Commissioner and Deputy Speaker, Scheduled Caste Certificate Checking Committee, Konkan Division, Vartak Nagar Ward Committee Office, 3rd Floor, Vedanta Complex, Vartak Nagar, Near Thane Corporation, Thane 400406. Start Date to Apply Offline: 11-05-2018. Last Date to Apply Offline: 18-05-2018.